USD-INR after making multiple bottoms at 43.8 zones gave a breakout above 45 recently and has spiked up sharply. 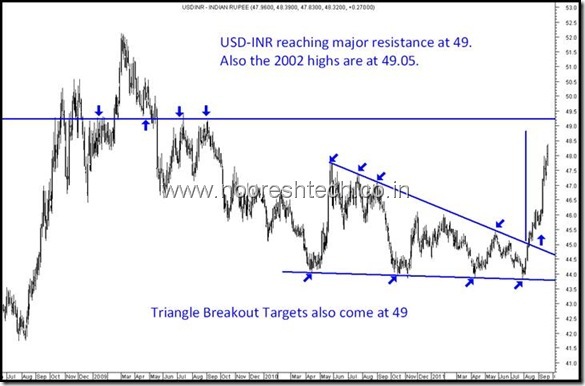 The target projection for such a breakout would be 49 in short term which has been reached. 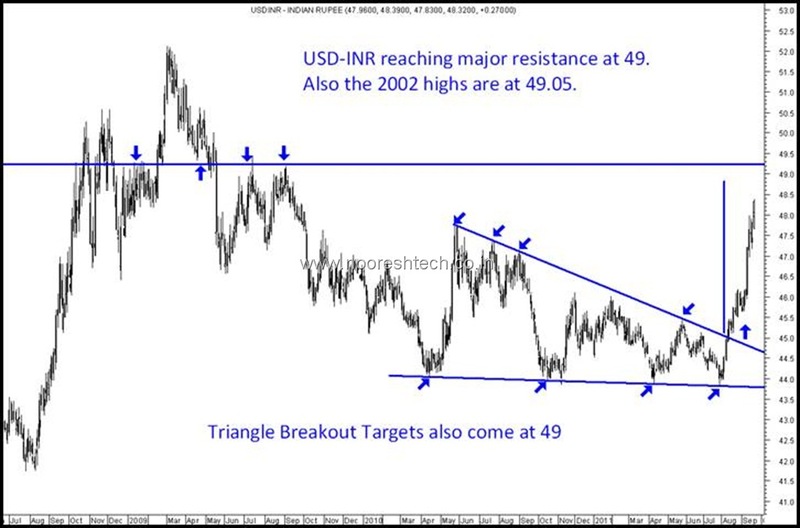 At 49-49.2 we have lots of previous bottoms/tops acting as resistance and with a such a sharp rise we may expect USD-INR to consolidate and even dip a bit to sub 48 levels. Also the major top for USD-INR last seen was in 2002 around 49.05 levels. The only time has breached above 49-50 levels was in the panic of 2008. So in the near term as well as medium term 49.2-49.5 becomes a critical level and also a possible topping out case. Only a move above the level of 50 could imply a panic in currency like 2008 but it was very short-lived. 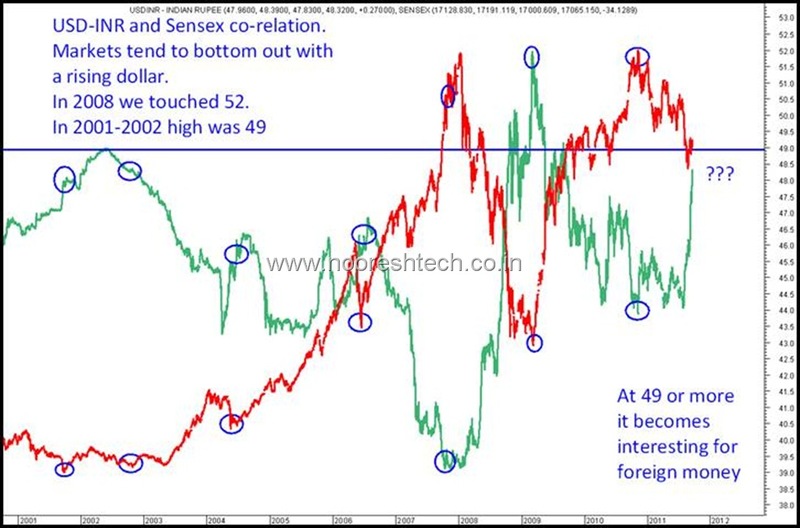 If we try to compare various peaks/troughs( shown by blue circles ) on Sensex with USD-INR its generally seen major bottoming out formations have come with a spike in USD-INR. Comparing the current correction with 2008 it is seen that a dollar spike between 49-52 creates a very important long term bottom. Also one thing noted is USD-INR has never stayed above 49 levels for more then a few months. The max period being 1st half of 2009 when markets bottomed out and we saw a lot of foreign money coming in post that. a) USD-INR tops out at 49-49.5 and Sensex is pretty close to important bottom. b) USD-INR sees a spike to 50.5-52 with a panic like scenario in Sensex taking it sharply down for a short jerk. c) USD-INR goes over the roof of 52 ( not consided as of now- Out of the blue scenario ). The USD-INR relation suggests that next few months could be a bottoming out phase for Indian markets ideally with a possible top at 49-49.2. In a worst case scenario we may see a spike in USD-INR to 50.5-52 with possible negative global announcements but such a crisis phase has not lasted more then 3-5 months. The strategy should be to increase equity exposure in panics. Thanks Nooresh to cover this topic, recall I had sent a chart on currancy few days back and it has come true, which you rightly articulated. USD $ at 49.58 Rupee last night. so it will be intersting to know where we stop or pull back. when ever uds-inr goes to max . 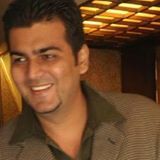 I have been following your post regularly and quite impressed by the accuracy of your calls. In this panic time would you be able to again suggest some good pics in mid-caps as well as large-caps? I have been following RIL, SBI, Bajaj Auto for quite a sometime now. We are on a slow buying spree in many stocks and ready to take a hit of 10% on the overall portfolio. You can look into Godrej Inds, Aditya Birla Nuvo on sharp declines. SBI remains a fav. What do you think, now with the USD/INR at 53.80? Are we going to 56-58 ? If so, what can we expect on the Sensex? Could you please provide me a source from where i can get ready USDINR+Sensex charting?